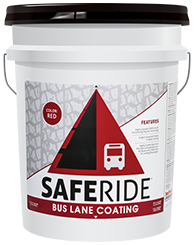 Safe Ride is primarily designed for bus lanes on asphalt streets and roads. Safe Ride provides a Designated Lane for buses and Safe Zone for loading passengers. Apply a minimum of two coats. Apply at a rate of 50 square feet per gallon per coat. A third coat shall be applied for maximum durability. Allow material to dry between coats. Surface must be clean from all oils, grease, loose materials, dirt and dust. Safe Ride is ready to use. Stir material thoroughly before applying. Apply Safe Ride by spray, brush or roller. If applying by spray, be sure to use an OSHA approved respirator for applying water based acrylic paints and coatings. Temperature must be a minimum of 50° F both during application and for a period of 24 hours after application. Do not apply if rain is imminent or forecast. Wash tools in water. Use proper cleaner if material has dried.